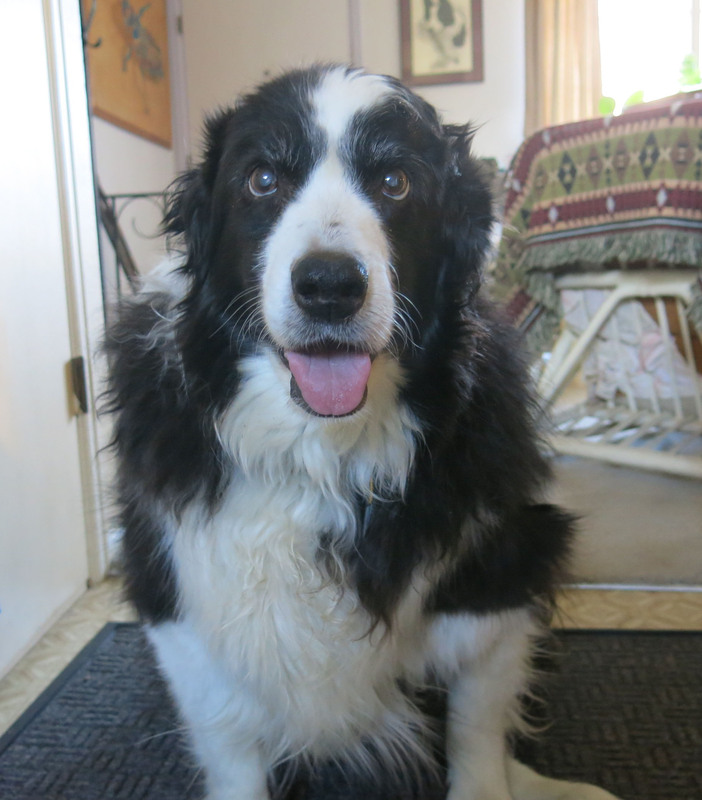 Greetings and salutations, everyone; yes, once again it is I, Chess the purebred border collie, filling in for the guy I live with, and hear to bring you some, well, at least moderately interesting news. You may remember me from such posts as “Guarding The Fort” and “Show And Tell”, among so many, many others. Here I am in a characteristic pose. You can probably see how things are going with me. The guy I live with has been obsessing again, or still, and so today’s post will be frightfully didactic, and yet mercifully short. The collar is the whitish thing on the right. 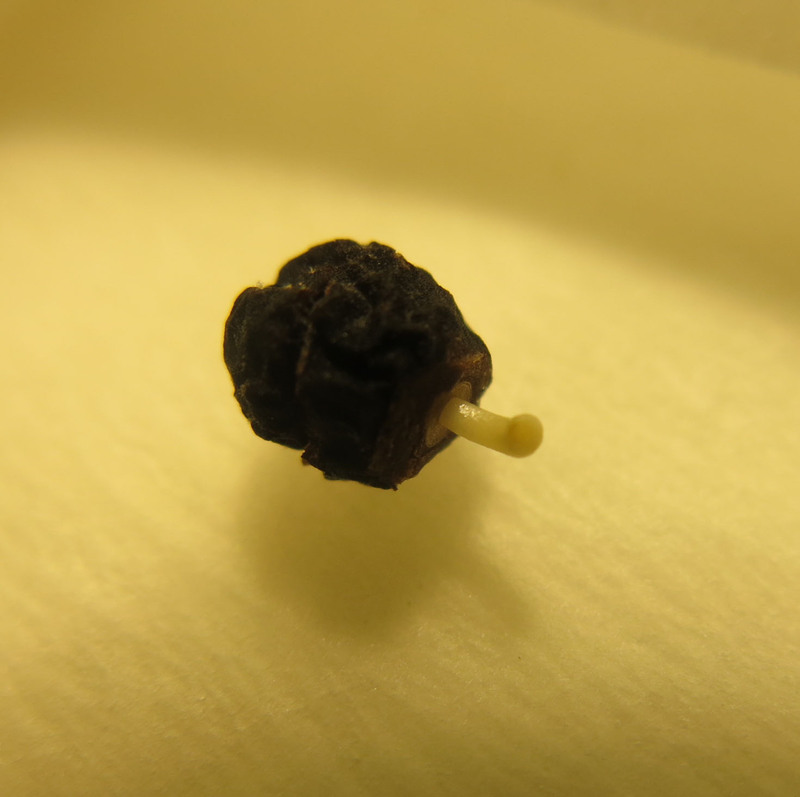 It gets pulled off with a dental pick, which is why the seed is soaked, to make it softer. 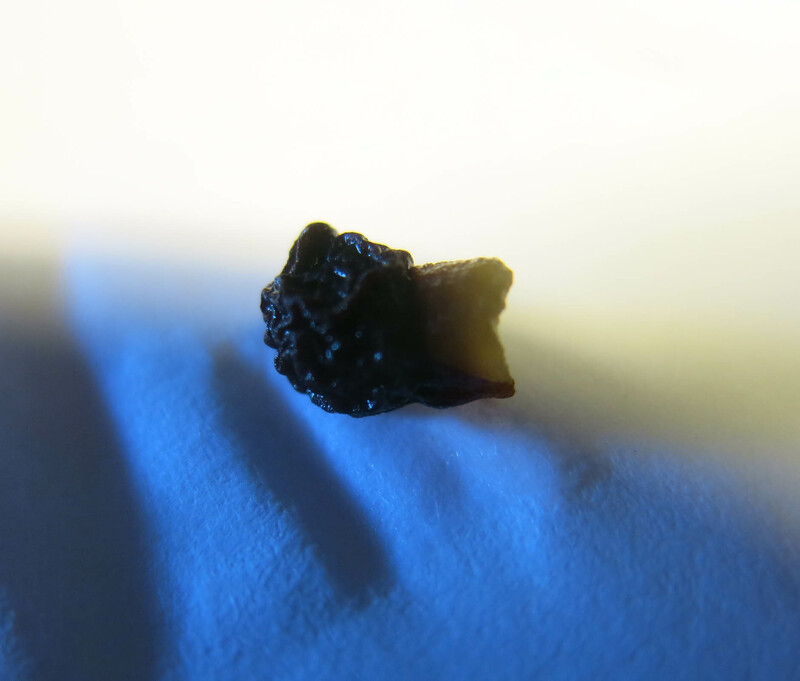 Then a small (less than a millimeter) slice is taken off the tip of the endosperm, and you keep doing this, until you have also cut a portion of the embryo. Like cutting across both the white and the yolk of a hard-boiled egg. Use a razor blade, with masking tape covering one side. 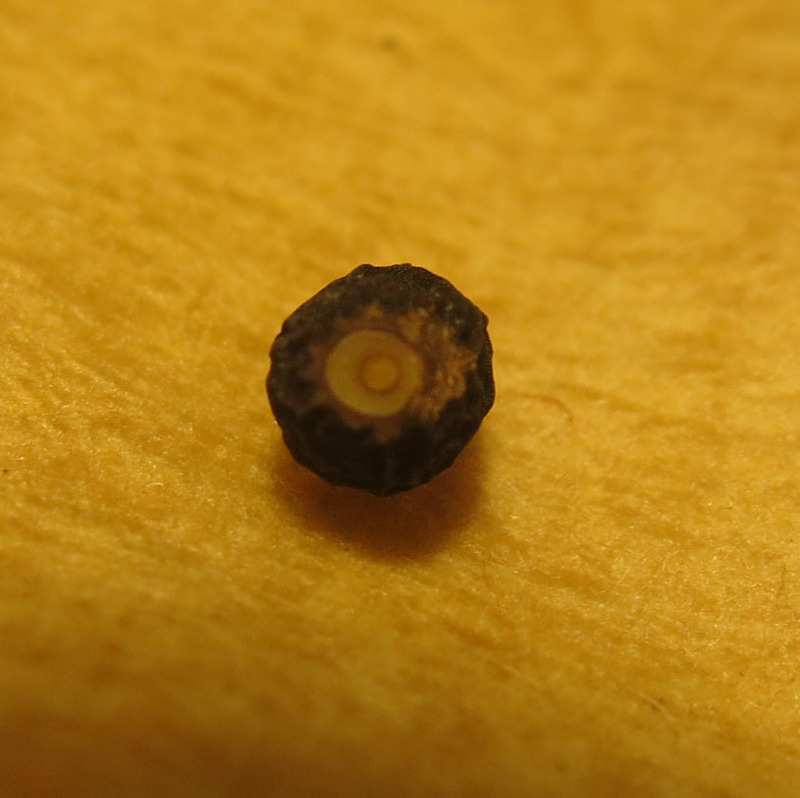 The seed in the picture below is probably not healthy, since you can see a brown ring around the embryo (brown is almost always bad in gardening), but it does show the embryo, surrounded by the endosperm, surrounded by the seed coat. I know this sounds like hyper-counterintuitive, actually slicing the embryo, but this is the root end of the plant, and if you remove just a little, things will be okay. Then stuff starts to happen. Sometimes. At this point the seeds can be planted, though the guy I live with said that Prof. Deno suggested leaving them in the filters until the first leaf has emerged. The guy I live with is not that patient. Well, that’s all. See, it wasn’t so bad, was it? This entry was posted in Uncategorized and tagged iris seed germination. Bookmark the permalink. Hi Chess, does TGYLW always start the germination process in the middle of winter? How long will it be until the fjrst leaf emerges? Are these emerged seedlings kept in a minicrib or in the house? At what point does he pot on? Are all the adult plants held in pots? Or has he risked some in the ground? Sorry about all these questions! Well, the guy I live with is an eccentric. And also, the neighbor kid, who’s seven, I think, sometimes comes over to hang out until his mom comes home, since this is a completely safe place, you know, and you’ve never heard anyone ask so many questions…… Especially when the duck laid an egg in the manzanita in the front yard…… Anyway, the reason the germination started now is because he read the instructions all wrong and forgot to cut the endosperm. That’s why. Once the seed begins to germinate, it’s only a matter of days before the leaf emerges. The germinated seeds are potted right away, in B.E.F. Grower’s Pots (of course) in a very light mix of mostly perlite, with a little peat maybe, and some Turface, sometimes. Watered with a mister. Grown in those plastic propagators made in the U.K. (purchased from Garden Talk in the U.S.). As far as adult plants are concerned, this is only the second time with oncocyclus iris seeds. The first, probably from the same Archibald collections, was done outdoors (success); the plants were planted out, and discovered by rodents (failure). The little plants will probably be planted out next August, and caged. The ones from the Levant will probably be held over for another year, and then risked in the ground. You never know. Hi again, interesting that rodents like the rhizomes. By this you mean rabbits? If so then there is an obvious difference between Euro/African rabbits and native American ones. I have never had my local rabbits (immigrants) take the slightest notice of my oncos. My biggest enemy is the slug, especially with delicate seedlings, followed by aphids, followed by rust. Last year I visited a renowned grower in South Australia (the state of) and I was amazed to see how casually she approached growing her plants. Large clumps were planted, unprotected, in open bushland in amongst the tussocks and the sags. No slug bait, no fungicides, just gravelly soil and dry air. 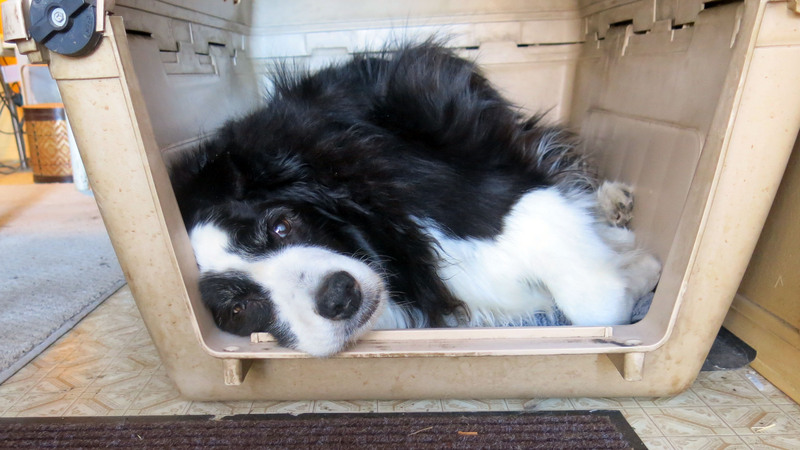 I asked her if she worried about the rabbits and the roos and she replied that they ignored them. She grows the best I have seen. You may have seen her postings on the Forum? No, we mean squirrels. They like to dig things up just to dig them up. Sempervivums get eaten right to the ground the day after they’re planted, if they’re not actually ripped out of the soil and carried off to be devoured. Delospermas, too. Yes, the guy I live with has been posting on the Scottish Rock Garden Club forum, which anyone can look at, and has seen those irises. No comment, I guess. It’s always annoying to see someone approach something so difficult so casually and have fantastic success. “Oh those, well, they just grow.” We have dry air and rabbits here, and a Roo, too, but for driving in. OMG, that is the very best thing I’ve ever read about gardening: “I asked her if she worried about the rabbits and the roos…” The way my brain works, it won’t let go of that adorable image EVER, and I know I’ll be saying that to myself whoever I start to doubt that this world is indeed a marvelous place to garden. Looking good today Chess and anther intersting post. My mum thought about doing a PhD on seed some time back as she finds them intriguing and all so different regarding their germination processes. Like you I find it a bit boring but was always at her side to help when she was working with her plants. She was told not to pot until the first true leaf appeared, not the first two leaves. However she was always excited when that first leaf appeared. You look very relaxed in the last pic, have you just had a biscuit or better still some brie. I hope your tummy is still well as you look very well and happy now. Thanks; my tummy is doing quite well. The guy I live with has to prepare my antibiotic by filling capsules with this powder, but it has certainly turned everything around. The only reason that the germinated seeds are potted right away is that it seems like less can happen to them that way, instead of sitting in a plastic bag in a coffee filter. He does check those every day, though. So far about two dozen seeds have germinated. That’s maybe not a lot, but guess who is not complaining at all? Thanks; it is pretty cool, isn’t it? Not our idea, though, by any means. It turns out that the guy I live with wasn’t following the instructions, and didn’t know what was going on, but when he had it figured it, well, he had it figured out. Someone, Chess – and I elect me – should comment on those brilliant photographs. TGYLW really should have them printed in Vogue or some such fashion magazine, so very Irving Penn are they. I wonder, did he ever look at the book Richard Avedon did on Western cowboys (that’s just a random wonder. One of my favorite books.) TGYLW’s most fascinating subject is, of course, you, dear Chess. Off to a history lecture now, all about photographs of our little town. Thanks; well, of course, it’s the subject, isn’t it? I guess when the whole world revolves around you, you just kind of glow, like the sun. Thanks for the educational post, and glad to read in comments that your tum is feeling better. Thanks; yes, I am feeling much better. I get an antibiotic powder (“for chickens, turkeys, and swine”, none of which I am) that the guy I live with has to measure and put into capsules. Turned my problem around within a day and a half.